A legend is re-born. The first ever Grand Seiko from 1960 is re-created with a new mechanical hand-winding movement. 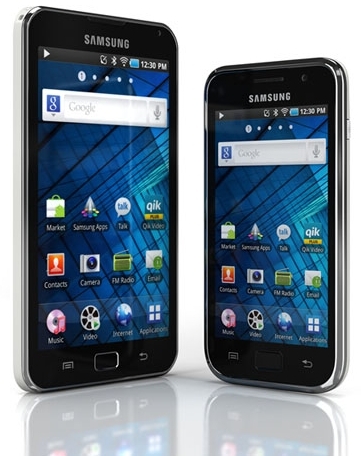 SEOUL, May 2, 2011 – Samsung Electronics Co. Ltd., a leading provider of Smart Mobile Devices, today launched GALAXY S WiFi 4.0 and a fresh addition to its smart player portfolio, the GALAXY S WiFi 5.0. Each featuring 4” and 5” screen-sizes and delivering the powerful application experiences as the original GALAXY S, the two versions give users an unrivalled entertainment experience through a clear display, a swift 1GHz processor and the Android™ 2.2 “Froyo” platform. The GALAXY S WiFi 4.0 will be first available in Russia and will be gradually rolled out in other countries. The GALAXY S WiFi 5.0 will be first available in Switzerland. “With the GALAXY S WiFi 4.0 and 5.0 we’re delivering a rich, immersive experience for multimedia enthusiasts.” said JK Shin, President and Head of Samsung’s Mobile Communications Business. “A large, high-quality screen, a world of fun and useful applications and great communications services make this a powerhouse device at an affordable price. The GALAXY S WiFi 4.0 and 5.0 will deliver all the rich smartphone experiences of the GALAXY S smartphone. With video communications via VoIP services and rich video and music entertainment with multi-codec support, the Samsung GALAXY S WiFi 4.0 and 5.0 will keep you constantly entertained. • Display: The clear display makes web surfing and multimedia viewing a joy. Keep your lifestyle mobile - enjoy movies, your favourite TV shows, photos and web-browsing anywhere. Samsung’s latest mDNIe image engine technology ensures that video and images look stunning. • Android™ 2.2 “Froyo”: The GALAXY S WiFi 4.0 and 5.0 feature the Froyo operating system, with a possibility to upgrade to 2.3 Gingerbread. • Application Customization: With access to over 150,000 apps available on Android Market™, the Samsung GALAXY S WiFi 4.0 and 5.0 are fully customizable smart devices. Integrated GPS support further expands the capabilities of the device, letting you benefit from Google’s map services and directory applications. • Google Mobile Services: Enjoy premium Google™ services such as Gmail™, Google Talk™ and YouTube™. Utilize voice recognition technology to search with Google faster than ever on the Internet. Stay plugged into the world with premier Google applications. • Samsung Social Hub: Your entire social life in your hand. Simultaneously post messages and pictures on Flickr, Facebook, and Twitter using Samsung’s Social Hub. The integrated address book provides the ultimate command & control station for the most popular SNS services. Synchronize your personal calendar with friends, family, and the latest events. • VoIP Voice & Video Calls: The GALAXY S WiFi 4.0 and 5.0 utilize cost-effective video and voice communications services. The Qik application allows video chat which can be shared over social network services. • HD Video & Images: A camera lets you shoot and share your life, capturing high-quality video or still images. The Samsung GALAXY S WiFi 4.0 and 5.0 support DivX HD, allowing high-definition video playback; Support for various codec standards including MPEG4, H264, DivX, XviD, WMV codecs ensures you can enjoy huge catalogues of content from all over the web. • Audio excellence: The Samsung GALAXY S WiFi 4.0 and 5.0 “Smart Player” put entertainment at its core, designed to deliver the best possible audio and video experience. Samsung SoundAlive™ technology provides unrivalled sound quality, with deeper bass and greater tone articulation. • Enhanced Memory Capability: Packed with generous 8/16 GB memory, plus mircoSD slot and powered by a powerful 1GHz for an industry leading performance, the GALAXY S WiFi 4.0 and 5.0 are equipped to handle any user demand.